Our first big show of the season is in the books! Strap in for a BEAST of a post guys, because I’ve got lots to say. Don’t worry, we also have lots of great pics thanks to the best show friends ever. And holy crap guys, I have to put this out there straight off: Francis. Was. Amazing. Like, I can’t even express the amazing. This horse has come SO far in a year, is SO much more educated, and legit was perfection all weekend. I certainly have plenty to work on, but the horse is totally aces. Now that we’ve gotten that out of the way and you know that Francis is a real professional show pony now, we can get into the good stuff. Francis shipped into the showgrounds on Thursday and got a training ride with a good report card- a storm was blowing in while Trainer was on him and he was apparently a little looky with all the wind and noise, but settled into work once she set the screws to him a bit. She let me know to show up bright and early the next day to kick things off. On Friday we opted to do a warmup 1m class in the GP ring for a couple reasons: 1) To get us listening to each other before out 1.10m classes and 2) to let us get into the GP ring before our classic on Sunday. Not that Francis cares, but Trainer knows I like to get the lay of the land if at all possible. No hard questions here. The intent was to treat this as a schooling round- I didn’t want to go in there and gallop around. The footing was super soupy from the storms so my plan was to stay balanced and get some adjustability from Francis. I felt like he really delivered! We got a bit of a launcher at fence 5 when I asked too late for the move up, but the rest of the time we managed to get some pretty good, close distances. Especially at that height where Frankie doesn’t need to work too hard, we wanted him listening to the base- I had to wrestle him back a bit through that last line towards home, but he obliged and fit in that last stride. Overall it felt like a very competent schooling round with a few sticky spots but plenty of good spots, and that perfectly met our goal going into the ring. Even with a rail, it was good enough to get us 8th out of 20ish in an open class! I love the flags in the background here, we got the Grand Prix look! You guys. Francis is picking his knees up. OMG. Note the lake right behind us. Srsly so soupy. Jumping into the last line towards home. I had to sit down hard after this to ask him to fit the strides in that last line- he could see the in-gate and wanted to gallop home. We then had quite a while before our first High Adult round went in Jumper 1, and Francis took full advantage of that break. You don’t even realize how long he was down there. HOURS. Pretty sure he was snoring. We thought he’d try to get up when we came in to bug him… Nope. He was very content to stay where he was and snuggle. Sadly, we did eventually have to rouse him from his nap and pick the shavings out of his tail. He gave us plenty of sighs to let us know what a bother it was. But he had to go cart his Momma over some colorful sticks! I was not nervous per say, but a little intimidated. Sure, we went in the Highs at 1.10m back in January, but I’m pretty convinced those jumps were set at a VERY forgiving height. So for me this felt like our first REAL time going out there at a true 1.10m in competition. Slightly less damp by this point in the day. But as soon as the buzzer rang, that apprehension flew out the window. Was it a perfect course? Absolutely not! But the height didn’t even seem like a factor- the sticky spots were due to my own mistakes and not due to any difficulty making it over that height. We got a flyer to jump 1, which led to me letting him get a bit strung out and knocking fence 2. That meant that the line from 2 to 3 which had walked a little tight ended up being more of a push ride out. Then I got a bit up on 4a and had to kick out of the two-stride, but that set us up to gallop out of stride over 5. He jumped the snot out of this one, I splurged on the pro pic. The pro pic is basically a clearer, more zoomed in, better version of this crappy screenshot I grabbed. Of course I had to get the pic, look how cute he is!! I needed more left leg to get a better track across 6, but bending out over 7 was nice and 8a-b rode fine. That five strides out over 9 was tough and ended up being an ugly jump honestly. The last line actually felt fantastic though- Frankie gave me this incredible moment of softness about 1 stride out from 10 and it set us up to rock back and fit the stride in over the last fence. Jump 10. When we get that softness to the base, wow. Just wow. They did end up combining the Children and Adult sections so that rail was enough to keep us out of the ribbons in a class of 16. Honestly though, I was thrilled with Frankie and felt like this course was a really good representation of where we are together. (Be prepared to hear that again, it was kinda the theme of our weekend). Saturday was super fun for me- I got to play owner! We had Assistant Trainer take Francis in the 1.15m class so he could get some confidence building miles at that height before he has to deal with the height AND his mother. Someday my leg will be this strong and stable. Someday. Some comments from AT when she came out of the ring: overall, she said Francis was a good boy and listened well to her. The close spot to the base still does not come naturally to him and he has to think hard about it, so she wants to work on his fitness to make that easier for him. But you know who earned his first blue ribbon? Very proud Momma with the star steed and best AT evah. She may be tiny, but the woman has totally inhuman strength. She’s amazing. On to Sunday! We had our classic first thing in the morning, then a speed class to round out our weekend together. Of course my eyes immediately went to 8abc. The elusive triple combo. I really liked this course. It asked some harder questions than earlier in the weekend but nothing felt tricky or intimidating. There were plenty of options. The footing again was REALLY soupy so I didn’t want to turn-and-burn too much. We ended up knocking a couple rails because, you know, me. But there were a couple parts to this course that I was thrilled with. The first was 5ab to 6. We turned inside 13 to get there and only had one straight stride, but we were able to power through and then balance out over 6. It rode nicely. Then I am just over the moon about the triple combo. 7 to 8a walked in a shaped bending 9 strides, but after watching some rounds Trainer and I decided that I would land and hold him straight and upright for 4 strides, then turn and send him forward for the final 4 to put 8 in there. That worked out PERFECTLY. We were able to come into the triple carrying a good pace to the base and there was no sticky point throughout- he carried us through like he had done it a million times. Of course I was so excited about the triple that I stopped thinking and had a ridiculous distance to 9, but we recovered for the last line. Womp womp. Again- not a perfect course, but very representative of where we are as a team and a huge improvement from just a short while ago. When I have the presence of mind to ask, Frankie delivers every time. I just have to think a bit faster on course so I can time the ask better. Francis had a 2 hour break before our speed round and obviously he lay down for a nap. And guys. He did NOT want to wake up. I was pushing him, poking him, pulling him, cajoling him, and he basically gave me the horse version of “Moooom 5 more minutes.” He just kept leaning into me for more scratches. Clearly Homeboy was conserving his energy though, because he then went and gave me the speediest speed round he’s ever done. I don’t have any clear pics from this round, but I’ll tell you right now that it was pretty chippy because WOW Francis was galloping around. I have a video that I’ll share with you eventually but you’ll have to promise not to judge me. Imagine us jumping over this. We did the inside turn from 8b to 9 which worked great, but other than that pretty straightforward. But that’s the great part about the jumpers- it doesn’t matter how pretty you are, as long as you get the job done. And Frankie was really excited to get the job done. Ears forward, galloping around, finding the fences. He heard that buzzer and said OK LET’S GO. Not a bad way to round out our weekend. Frankie is simply so much more educated than he was last season. While he still likes a very active ride, he didn’t need constant instruction on where to place every foot. He was confident and willing to go forward and listen instead of needing constant reassurance and getting “stuck” in places. He heard the buzzer and moved out. He felt me sit and waited for my cue. He feels like a trained jumper horse now- not just a Very Good Boy who is happy enough to go in the jumpers. The transformation from a year ago is astounding to me. He is a completely different horse than we brought home and is constantly surprising us and delighting us with how trainable, athletic, and willing he is. Trainer said that we first started out last season in the “hang on and pray” stage. Then we moved on to the less dangerous “find your pace” stage. She said we’ve now moved on past that to a point where we can have some fun with our courses. We can confidently make a plan, because we both have the fitness and knowledge and ability to stick to the plan. We can strategize how to make each course work best for us instead of just trying to make it around in one piece. We have a very long way to go and acres of improvement to make, but we have come such a long way in the past year. You may notice that Frankie is picking up his knees in most of these pictures. If you’ve followed along with us for any amount of time, you know that Frankie generally jumps like a drunk alpaca. Somehow the combination of increased fitness, increased education, and jacking the jumps enough so he had to put a bit of effort in has led to a horse that actually jumps kinda cute! Go Francis! In terms of behavior, I was so happy with Frankie. Is he a big dolt who needs a reminder to hold still sometimes? Absolutely. We will be working on that. In terms of his demeanor though, he was relaxed and happy and chill the whole weekend- as evidenced by his constant napping. He stood for baths, walked around quietly on the buckle before and after his rounds, and loaded on the trailer to go home without blinking an eye. Really our partnership has grown so much. I feel like the luckiest girl in the world to grow and learn with this incredible animal. For the first time in about a month, I actually jumped my pony over colorful sticks! This is pretty much all I’ve done for the last month. Toodle. Nothing crazy- some grid work with placing poles to inspire straightness and encourage a good effort over the jumps. Seeing as Francis thinks lifting his shoulders and picking up his knees and rounding over his back over jumps is like OMG SO DUMB, this was a fantastic exercise for him. So trot in to the crossrail, one SHORT stride to the oxer, then one bigger stride to the vertical out. Poles to keep us straight to the oxer, then straightening poles over the vertical. Then a pole after the vertical because FRANCIS STOP SUCKING OUT TO THE WALL. The added poles were really what made this grid work so well for us- that first stride to the oxer was super short. As in, the first time through we definitely bounced it. #18footstride. No bueno. The trick was to get a short powerful trot in, so that he could land close to the crossrail and put in a nice short stride there. That channel created by the poles forced him to keep his body straight and not give himself extra room by bulging to either side. Homeboy actually had to pick himself up. Then I LOVED the straightening poles over the last fence. You’ve all seen pictures of Frankie jumping- homeboy is athletic enough and is happy to jump anything, but he doesn’t have the most…classical…technique. As in, he jumps like a llama. But the V-poles here really forced him to pick his shoulders up and stay completely straight, instead of leaning to either side. And while I don’t have media, I could feel him jumping SO CUTE. When your horse typically jumps like a drunk alpaca, it’s pretty easy to feel the difference. It’s such a nicer motion to stay with- I could let him push me up out of the saddle and give a really generous release instead of trying to figure out where the center of balance is and keeping a feel because lord knows we’re going to land in a heap and we need all the communication we can get right now so help me. The pacing of this exercise was also something I needed to work on- you really had to ride one jump at a time (no kidding Olivia, that’s what we call “progressing through time.”) But what I mean is that the timing of the aids had to be more precise here. That first stride was very short. Meaning we could not canter in, we could not beast-trot in (that’s an official dressage term btw). We had to get a powerful, short, straight, elastic trot in and keep shoulders up to collect the first stride. And then over the oxer I needed to PRESS and land moving for the bigger stride. If I asked too early for the bigger stride, I made Frankie’s life harder to the oxer. If I asked too late, I made his life harder to the vertical. If I timed it properly, I set him up for success at both jumps. Side note- I love that even after doing grids for almost 20 years, there’s still so much to think about and consider even when they’re simple like this. Grids 4 lyfe. After going through a couple times successfully- proving that it wasn’t just a fluke- I asked to be done a little early so we could end on a really good note. I needed a win after dealing with some stress at work lately, and Francis delivered. Because he is literally the best horse on the planet and if you disagree I will fight you in real life. I have to give a HUGE shoutout to Assistant Trainer here too. She’s been putting some pro rides on Frankie lately while I’ve taken a break from lessoning and it is seriously so noticeable. He always WANTS to give me the right answer, and she does such a great job of explaining to him what that right answer is. I’m incredibly grateful that I could take a month-long break from doing anything besides toodling, hop back on my horse, and have him more educated and fit than he was when we left off. We didn’t do anything super crazy with this lesson- none of the jumps were very big at all- but it was the perfect way to knock some of the rust off. Frankie was happy, he jumped cute, I was less jiggly/loose in the tack than I anticipated I’d be, we worked up a good sweat, I loosened up some of the knots in my neck and back, and overall I count this as a successful therapy session. Bonus points that it was good training for both of us. Still here, still kicking. As mentioned in my last post, things have been a little crazy busy lately and I’ve had to carefully manage my commitments. I was hoping that taking a step back from blogging would do the trick, but I was still having a lot of stress around the clock and something else had to give. And sadly, that has been barn time. It’s the last thing I want to cut back on, but the only thing within my control at the moment. So Francis and I haven’t had a lesson in a few weeks, and I’ve only gone out to the barn mayyybe 2x/week. He’s had a few pro rides, I’m letting him be used in a few lessons, and I’m making it out when I can so he’s still getting ridden with some consistency. At first I felt really guilty and bummed about this- I have such big plans for this show season! I want to ride! I don’t want other people riding my pony in lessons! My poor boy is being neglected by his mother! But you know what? Life happens. Things will either calm down or I’ll learn to manage them better, and we can get back to our 5-6x/week training routine. This is part of being an adult ammy. Frankie absolutely doesn’t mind the relaxed training schedule, he’s probably thrilled! And this is the part where I tell you just how grateful I am for my boy. Our rides lately have been chill WTC hacks- nothing advanced or difficult, just some equine therapy for yours truly. Francis has come out every single time with his sweet eye that I fell in love with the first time I saw him, happily bopped around with me, and soaked up my attention. It feels like he knows this is what I need right now. He’s been getting more and more powerful and “spicy” to the jumps lately (I use that term lightly, because Francis), so to feel him back himself off into My Little Pony really makes me emotional oh my gosh I’m tearing up as I write this because I love my horse so much. We even celebrated our 1 year anniversary of him joining the family! We wore matching hats, shared a bag of apples, and enjoyed a nice relaxing ride together. I’ll have to post my rambling introspection on how we’ve both changed over the last year in another post- there’s just way too much to say there. Needless to say, it’s been the best year of my life and I wouldn’t trade a single moment of it for anything. He was VERY unsure about the hat. Until he realized it was not for eating. Then he lost all interest and allowed me to wave it around and put it wherever. Due to my lack of saddle time lately I decided to opt out of the show on 4/9 (competing at 1.10m after not jumping for a month seems…dicey), but I’m hoping to be back in the swing of things for the first week of Culpeper later in April! 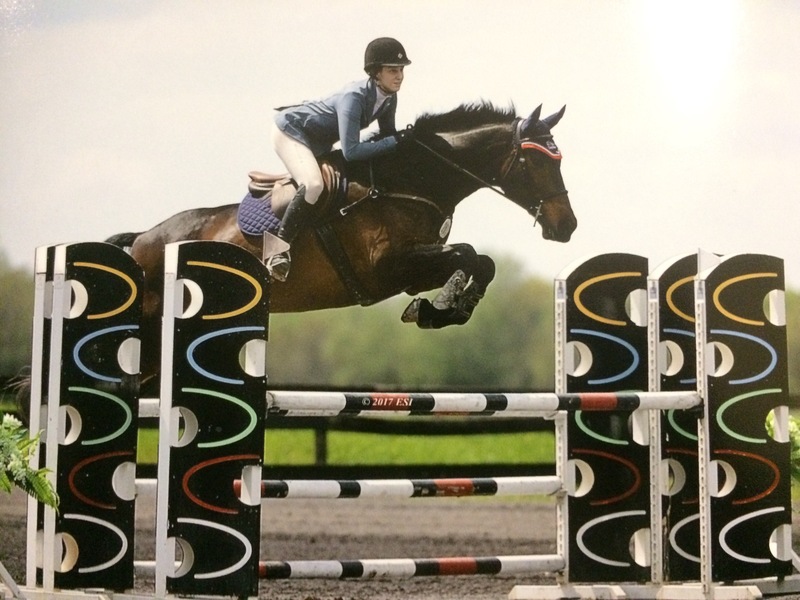 We’re planning on doing the High Adult division to lock in some more points, and tentatively (and I mean very tentatively) thinking of having either Trainer or Assistant Trainer take him in a 1.15m class to get some confidence-building miles at that height. I’d like him to navigate that height with a competent pilot up top before he has to jump that height AND deal with his mistake-prone mother. We school that height comfortably together at home, but we all know that shows are a whole different animal.